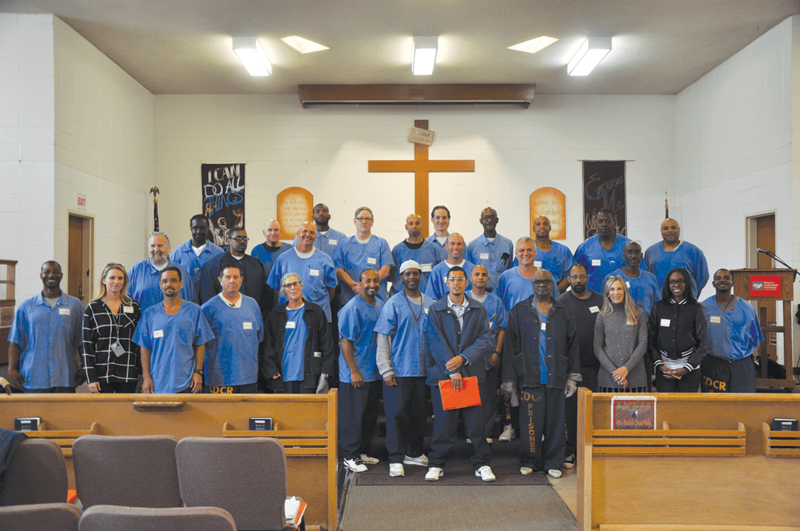 Twenty-two inmates graduated from the Prison to Employment Connection’s (PEC) seventh session at San Quentin State Prison in May. A week before graduation, the men did face-to-face interviews with employers looking to hire qualified formerly incarcerated citizens. More than 40 men enrolled in the program in February to learn about interview skills, resumé writing and other forms of communication. In doing so, they were able to determine what career path was right for them upon release from prison. “I was really excited to interview with some of the employers that [originally] I didn’t think I would want” (to work for), said inmate Robert Polzin, 42. He’s been incarcerated two years. Polzin said he thought he’d be a welder but thinks he’d be a better supervisor. 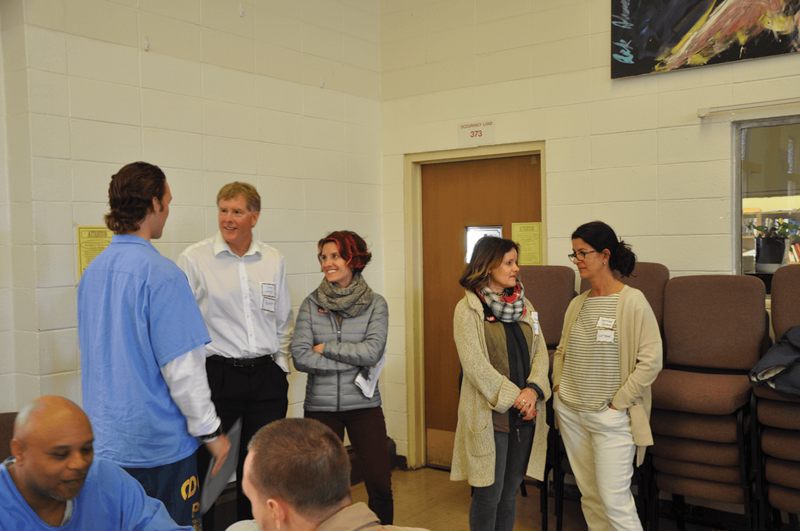 Diana Williams, PEC’s executive director, led the employers and guests into the prison’s chapel, where the inmates lined up to greet them, shaking hands with friendly smiles. She reminded the men of what they’ve accomplished over the last 15 weeks. “You are so ready,” she said. Many of the employers agreed. 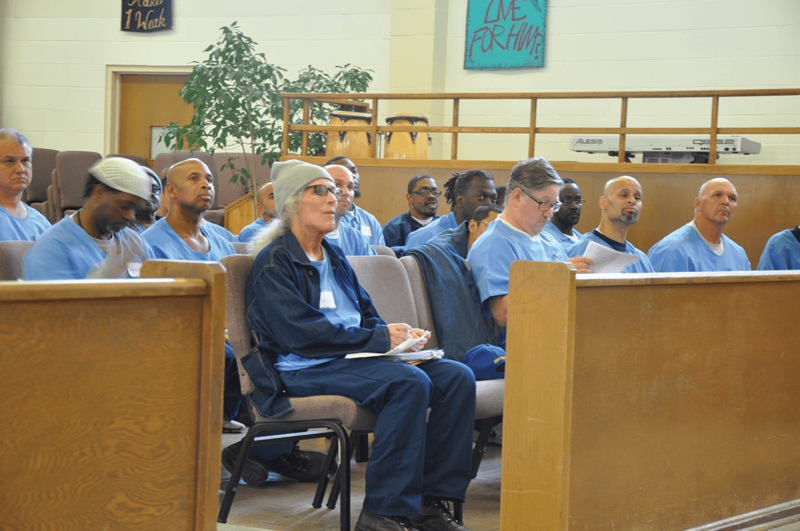 The program also offered reentry information and services for the men. Pastor Ronnie Muniz is formerly incarcerated. He served time in San Quentin in 1989 and paroled in 1995. He now works at two churches to provide reentry services. He helps the formerly incarcerated reconstruct their lives. Bart Pantoja, a business representative with District Council 16, Apprentice Program of Northern California, made his first appearance at PEC. His organization has attended several employment seminars at San Quentin. He said the event is great and has purpose. “We try to recruit because our industry needs more workers.” They offer “union apprenticeships in drywall finishing, floor covering, glazing, highway striping and commercial & industrial painting,” the District Council brochure states. “I think I made some great connections,” said inmate Harry “ATL” Smith, 31. “I met some good people. They really care about us and want to give us a second chance.” Smith added that Pastor Muniz told him he has a job and a place for him to live through the church. For inmates interested in self-employment, the nonprofit MEDA offered its Mission Economic Development Agency’s information packet on starting a business, in addition to its Work Force Development Program. Although attrition accounted for more than half of the original attendees dropping out, Williams acknowledged inmate Jayro Magana, 21, the one in the Youth Offender Program who made it to graduation. He was the youngest in the class to stick it out. “I think you’re going to go out there and do great,” Williams said to Magana. Inmate Aaron Tillis, 34, said, “I’m grateful, because I’ve never taken the time to have a formal interview.” He added that he was nervous but now he feels confident. He will parole in April 2020. Several guests heard about the PEC program and came to observe. Malcolm Gissen was among them. This was his fourth visit to San Quentin. Tom Lacey was another guest visitor. This was his first time attending the PEC event. He normally comes into San Quentin for the basketball games because his son plays on a team that competes with the inmate team. He said the purpose of his attendance was to understand what he can do to “marshal more resources” for PEC, which is a nonprofit. A new aspect was added to this PEC session. Human resources professionals from Clif Bar & Company made their services available. 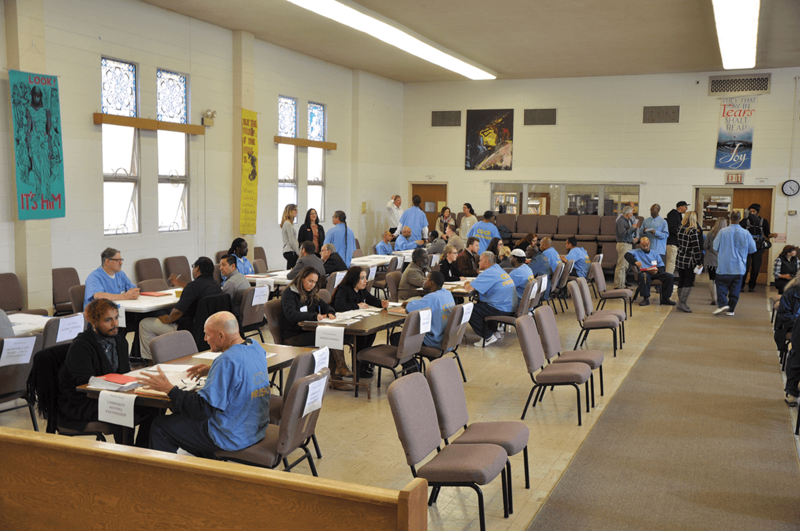 Halfway through the course, these volunteers came inside the prison and worked with the men to write resumes and do mock interviews to prepare them to meet employers. During the graduation, Williams read interview assessments from employers and listened to feedback from the men before passing out certificates and a list of employers that hire ex-felons. She said that according to the employers’ assessments, 100 percent of the graduates interviewed the same or better than people in outside society; another 87 percent did better than those outside. “They (employers) seemed to go out of their way to make us feel comfortable,” said inmate Maurice Brown. Inmate Christopher Scull said, “I had a good time and it was a great opportunity. I’ve been out of practice but I never forgot it,” referring to his ability to interview and communicate with people in free society. “I love this program,” said Gabrielle Nicolet. “This is the highlight of my week. I’m sad that it’s over until August.” Nicolet is a former probation officer for juveniles in the state of Illinois. For the past few years she has helped facilitate PEC with activities such as grant writing. Bre Davis, another PEC volunteer, said, “It gets better and better. This has become one of the things I look forward to after a busy day at work. We learn from them (inmates) as much as they learn from us.” Davis has been volunteering with PEC for two and a half years, on and off. She previously worked with the California Reentry Program. She has experience working on reentry with men and women on probation in Alameda County. Williams has been volunteering at San Quentin for four and a half years with California Reentry Institute and TRUST (Teaching Responsibility Utilizing Sociological Training). She is the executive director of PEC. She holds an M.A. in counseling psychology and is a Certified Professional Co-active Coach. “PEC showed me there really are people out there that want to give me a second chance,” said inmate Eddie Herena, 35. The San Quentin News photographer was found suitable for parole in February. He credits Williams, Davis and Nicolet for making it possible and thanked them for the opportunity to be a part of the program.